The gig economy was born in the wake of the Great Recession; since then, full-time freelancing has risen in popularity. With many now predicting that most of the workforce will be full-time freelance in the next decade, marketers and marketing managers alike must plan for their future. In 2016, after spending years as the head of marketing departments, Mike Volkin quit his job. He felt liberated to be out of the office, especially his office chair. “Humans weren’t designed to just sit in a cubicle for eight hours a day and just work,” he says, now leaving work once a day to play tennis under the California sun. After quitting his traditional job, Volkin started working as a freelancer and entrepreneur; he now runs his agency, 800lb Marketing, and works as a fractional CMO for many small and midsize companies. As a fractional CMO—essentially a freelance marketing executive and strategist—Volkin hires freelancers and staffers, holds weekly meetings and sets the company’s marketing strategy. “I’ll get a department up and running and headed in the right direction,” Volkin says. He never becomes the CMO of any single company and doesn’t want to; he’s able to work with different companies on a contract-to-contract basis, paying for his own health insurance, setting his own schedule and making a good living—he says that he makes $10,000 or more most months. Though Volkin’s role as a roving CMO is unique, he’s part of a growing trend of full-time freelancers in the job market. According to the 2018 Freelancing in America report by Upwork, Freelancers Union and Edelman, 28% of full-time workers are now freelancers, up from 17% in 2014. This number will rise, according to multiple studies—Robert Half International reports that 34% of the economy will be freelancers by 2023; another report by Upwork goes even further, saying that the majority of the workforce will be freelance by 2027. “I think that’s conservative, actually,” says Volkin, who also works as an entrepreneur coach. Volkin says that he’s had more inquiries from coaching clients about going full-time freelance in the past year than in the previous five years combined. He estimates that 20% of those inquiries have been from marketers. Thus far, the trend of working and striving for full-time freelance trends younger. Prudential’s 2018 Gig Economy Impact by Generation surveyed millennial-aged workers and found that 62% believe traditional full-time employment will disappear in the next three decades, with freelancers making up 75% of the job force. The report also surveyed older generations—Generation X and baby boomers—who tend to work as full-time freelancers due to circumstance rather than by choice like millennials. The younger generation, the report finds, possesses a greater comfort level with taking career risks and views freelance work as a step toward realizing long-term goals. 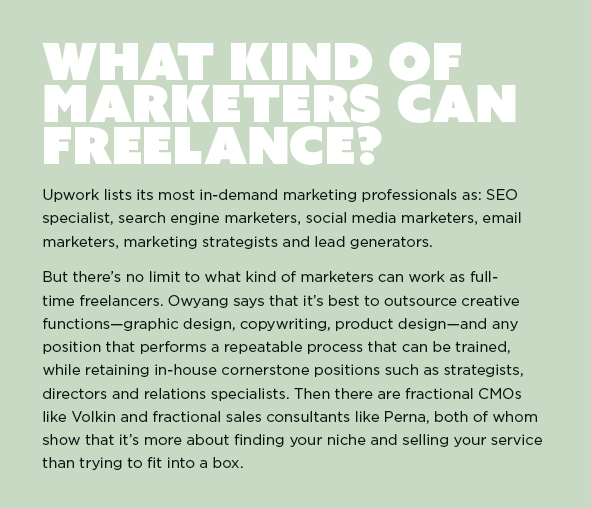 In 2014, marketing managers began employing more freelancers, Owyang says. According to a 2017 report from Upwork, 58% of marketing managers use freelancers to help scale projects and fill staffing shortages. The move to freelancing full time can be scary for marketers used to regular paychecks and a benefits package, just as hiring an outside creative can be frightening for marketing managers who want to protect their intellectual property and brand voice. But while the relationship between marketing and freelance is new and growing, curious marketers can learn from those who have blazed a trail in the early days of marketing’s gig economy. For those in their prime working years, feelings of freedom and growth are often stated as reasons they’re drawn to full-time freelancing. The 2018 Freelancing in America survey asked full-time freelancers and non-freelancers whether their work “provides upward mobility”—72% of freelancers agreed, compared with 53% of non-freelancers. The difference may be the result of freelancers more actively educating themselves—70% of full-time freelancers updated their career skills in the past six months, the report found, compared with 49% of non-freelancers. When workers were asked whether their job “provides appropriate pay for my skill-level,” 77% of freelancers agreed, compared with 62% of non-freelancers. In addition, the report says that the number of high-earning freelancers—those who earn $75,000 annually or more—is up 15 points since 2014. “Do you require the structure of knowing where your next paycheck is going to come from?” Volkin says that freelancers may make $10,000 one month and $2,000 the next—some people can plan for that, others get freaked out. Case in point: The Freelancing in America report finds that 63% of freelancers feel anxious because of the unpredictable nature of their work. “Do you like to go to an office every day?” If someone dislikes going into an office, Volkin says that they’d likely have the determination to work on their own. Working alone is one of the biggest changes Goliger experienced when she started freelancing full time. She’s not alone: 56% of freelancers say their work makes them feel isolated, according to the Freelancing in America report. Most of Goliger’s jobs have been remote, save for a couple of companies that have asked her to come in to build a closer relationship, and she only has a couple other friends who also work as full-time freelancers in marketing. A good network makes the often-solitary nature of freelance a bit less lonely. Jennifer Perna worked in sales for about 25 years; by the end, in her role as vice president of sales for Blue Plate, she managed 32 people and was constantly networking. Now, in her second year as principal and owner of Fulton Market Consulting—Perna’s consulting business for sales and management in the catering, events and hospitality industry—she only manages herself, but has cultivated and relied on her network to fill gaps in her knowledge. Perna has found an accountant, a lawyer, business insurance and other skill positions through her network. Zach Weismann turned potential competitors into collaborators when he founded a group called MAG Impact Collective, a membership agency of consultants across the U.S. who work in marketing, strategy and design. The group of independent consultants will team up on pitches and projects, bringing in others from the group when the client needs certain specialties. The group, founded in 2018, has already pitched and won projects with brands such as Google, Chobani and Exxon. Many outsiders look at full-time freelance and worry about finding work, but as Matt Umbro wrote on MarketingLand in 2017, having too much work is often a bigger problem for creatives who survive on their reputation. “People hire freelancers because they don’t want to pay agency prices, but they expect agency-quality work,” he writes. When working as a freelancer, you are your own agency, your own business. As Umbro writes, each project puts your name and reputation on the line—fall short enough and word will spread, whether through word-of-mouth or online reviews. Every freelancer interviewed for this story mentioned that this means they are, to some extent, always thinking about work. Freelancers are expected to quickly respond to emails, answer calls and turn in great work on each project. Some people excel at this, while others wish they could return to the security of a cubicle. When Volkin hires freelancers, he’ll test them. The test won’t be on any skill, nor will it be apparent to the freelancer, but he’ll watch how they communicate in the first exchanges—how quickly do they respond? Are they open and honest? Can they have a good relationship? But Volkin says that it’s just as important for marketing managers to communicate well—they must know what they want from a project from the start and set parameters. Doing so early will save time and avoid miscommunication. Managers can also look at freelancers’ ratings and reviews on platforms such as Upwork, Crowdspring and 99designs. If one freelancer has a series of critiques on his communication, for example, Volkin says that it may be best to avoid that freelancer. Outside of these rating systems, Owyang says that companies often internally pass around names of well-liked freelancers they trust to do good work for other parts of the organization. When Goliger first started freelancing full time, she branded herself as a full-stack marketer. Very quickly, she developed a niche in paid advertising, similar to her last role at HubSpot. Freelancers often debate whether they should be generalists or specialists, but Goliger says that she believes that having the skills of a generalist while focusing on a marketing niche is best. “You’re able to talk about that channel specifically, your experience and the results that you’ve delivered,” she says. For those who find their niche, can work well alone and don’t mind waiting for the next check, Perna says that the rewards of working for yourself can be immense.